Please read first-hand accounts of how New Perspective Foundation has been able to help others. My son John sustained a spinal cord injury in a diving accident on Long Island New York, where we live, and was left paralyzed from the chest down. He is 25 years old and led a full and vibrant life! After being air lifted to Stony Brook hospital on Long Island, he underwent surgery to repair the C-6 disc in his neck. He was in the ICU there for 3 weeks and then air lifted again to the Shepherd Center in Atlanta where we have been for 2 months now; and will probably be here for another 2 months! The expenses one incurs in traveling back and forth from New York to Atlanta can be overwhelming! New Perspective Foundation was there for us to ease these burdens in helping with air, hotel, and gas expenses! They are truly a God send and we can’t thank them enough for their support, both emotionally and financially! God bless them for being there for us and caring so much! Before contacting New Perspective Foundation, I was down. I literally felt as if my world had come crashing in on me before my eyes. I knew I needed a listening ear but I didn't know whose ear or whose mouth would give me the inspiration and hope I needed to move forward. The conversations we had were nothing less than amazing. It made me feel like I had the inner strength to push me and my wife both forward. Often, I still find myself dwelling on some of the inspirational words they would say to me just to get through my down days. Even though my wife and I still have a ways to go and more obstacles to overcome, I still can not thank New Perspective Foundation enough for the words they provided me to help me through the days that have passed. On St. Patrick's Day, 2017, our son, Jack, was enjoying a day at the pool with a group of friends. While his recollection of the event is cloudy, his friends stated they saw him dive into the shallow end of the pool and not come up. Jack's head had struck the bottom, compressing his spinal cord and shattered his C5 and C6 vertebrae. He was immediately taken to Shands Medical Center at the University of Florida and had emergency surgery to relieve the swelling on his spinal cord and repair the two vertebrae. The result of the accident left him paralyzed from the chest down, with little strength in his hands. After 10 days in the ICU at Shands, he was transferred to the Shepherd Center in Atlanta, Georgia, about six hours from our home in Northwest Florida. It is no surprise that having to contend with a serious injury to a loved one comes with numerous stressors. Travel expenses is one of them, as lodging and gasoline costs added up after the numerous trips I made to Atlanta during jack's hospitalization. My wife, Julie, and I were made aware of New Perspective Foundation through the hospital staff, and immediately a level of stress was lifted off our shoulders. Our family is grateful to the foundation for the generosity and kindness that allowed us to put the worries of travel costs out of our minds and concentrate on Jack's recovery. God bless! 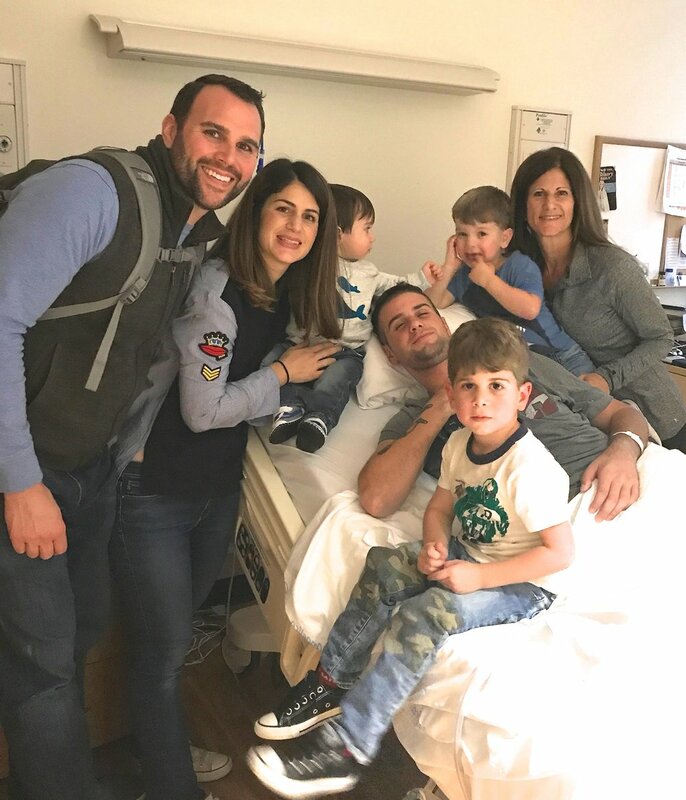 New Perspective Foundation has become a blessing to me, my husband, and my kids after five months of him being hospitalized following a spinal cord injury he suffered due to a fall in April 2017. With this injury, my husband has become paralyzed from the triceps down and has suffered damage to his diaphragm, making breathing extremely difficult. Driving three hours every day to the hospital and back was very costly, but New Perspective Foundation has alleviated some burden in travel and lodging expenses, allowing more of my thoughts and focus to be placed where it belongs. The most impressive thing in this whole process was how quickly they responded and provided assistance – within one day! Thank you all so much, as you've been an incredible bright spot at such a dark time in our lives. God bless you! Thank you so much for the generous reimbursement of our traveling expenses back-and-forth from North Carolina to Georgia. We are so grateful to be able to spend time with our son, Mitchell, while he was in the hospital. This journey has been challenging and difficult, but having one less thing to worry about really helps. Your kindness has touched our family! Thank you for your generosity and thank you for your kindness. May God continue to bless you and New Perspective Foundation! I I just wanted to take a minute to say THANK YOU to New Perspective Foundation! We reached out to them a few days after Kyle was in the hospital and heard back almost immediately. They put me at ease and made it possible for all of our family to be together to support Kyle in his time of need. We could not have done it without this foundation and I encourage everyone to "like" them and support them in any way you can. They are an incredible organization and I cannot thank them enough! On May 28, 2017, our son, Zulymon, experienced a fall that would forever change his life. After spending time with his friends during the day, he collapsed and fell on a set of stairs. He was rushed to the local emergency room and underwent surgery to repair the break at the C4 and C5 level of his spinal cord. The first few weeks were painful for him and equally stressful for the family. On June 6, 2017, he was sent to the Shepherd Center in Atlanta, Georgia. We were able to spend the first few weeks with him in Atlanta until we had to return to work. Our opportunity to visit with him was limited to weekends. The cost to and from Virginia to Atlanta were mounting, and then we found out about New Perspective Foundation. Thanks to their generous support, my husband and I were able to be with him on alternating weekends. Had it not been for New Perspective Foundation, our ability to spend that much needed quality time in support of our son's recovery would have been much more limited. We are forever grateful for the generous financial support and for the words of encouragement and support given to our family. On April 22, my son was in an automobile accident that left him with no feeling below his waist – Something no mother wants to tell her son at the age of 24. After three surgeries at UAB Hospital in Birmingham, Alabama, he was transported to the Shepherd Center in Atlanta, Georgia for rehabilitation. My husband and I both work full-time, but had to make the decision for one of us to stay in Atlanta with Cody, so he could get the rehabilitation that was needed. If it had not been for New Perspective Foundation's financial support, we would not have been able to do that. They spoke with me on the phone and not only offered financial support, but the emotional and heartfelt support they gave was also very comforting. This was a world I never knew existed and it's a comfort to know someone out there understands what we are going through. We will be ever grateful to New Perspective Foundation for the love and support they showed. Thank you from the bottom of our hearts!